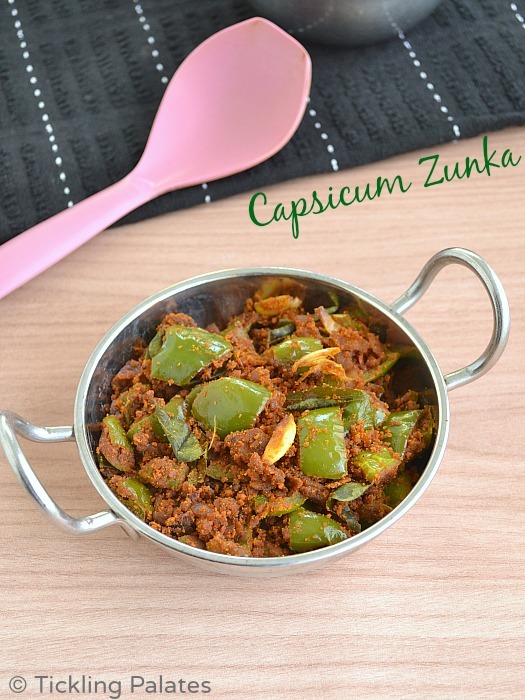 Capsicum Zunka is famous Maharashtrian Subji (dry curry) that is basically prepared with dry roasted besan (Chick pea flour) and tossed with other dry spices. It is very flavorsome and is very apt to pack for lunch boxes as it goes well with both rice and chapathis. 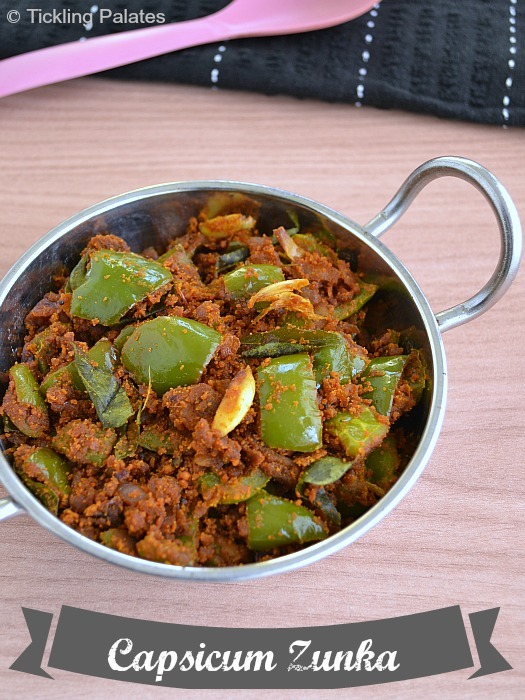 I have always known this as “Capsicum Senagapindi curry or fry” as its made by my mother often as she had learned it when she lived in Hyderabad for a while after her marriage. “Besan” is called as “Senagapindi” in Telugu and “Kadalai Maavu” in Tamil. 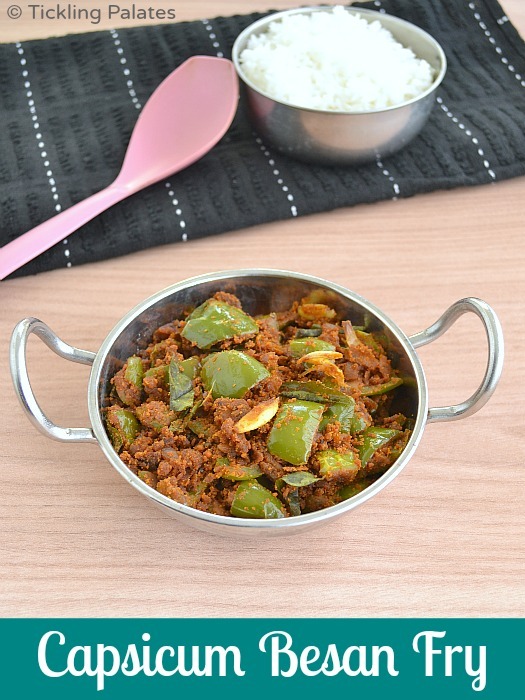 It takes very little time and spices to prepare this very quick, absolutely mouthwatering and flavorful side dish with capsicum as its one vegetable that is most loved by all at home. And its been more than 10 days since my last post. I believe I was a bit burned out and needed some “Me time” to rest and recuperate despite nothing being wrong with me. The monotonous routine took a toll on my mood making me less concentrative which made me take this unplanned break. I simply unplugged the laptop and put it away in a shelf. ya…. it was that bad. And I guess this break did do some good for me and now I’m back to business as usual with more zest. Some points to keep in mind before you make this curry is to keep patience. Take time to roast the chick pea flour over low flam taking care not to burn it and patiently roast till you get the wonderful aroma of it. Also do not dump the chick pea flour at one go else you will ed up with large lumps, so take the time and sprinkle by 1 tbsp at a time and make sure the first tbsp of flour is mixed thoroughly before adding the rest of the flour. Check out other easy curry recipes like Kantola Fry, potato capsicum curry, Phalguni Dal, Tindora Curry that will go well as side dish with both chapatis and rice. A quick curry using capsicum and chick pea flour that is served as a side dish with chapthis or rice. Cube the capsicum and keep aside. Chop the onions and green chilies finely. Smash the garlic pods with the skin and keep aside. Heat a pan and dry roast the besan over low flame till the aroma arises. Keep roasting continuously and make sure that the color does not change. This should take 2-3 mins. Transfer to a bowl. Heat the same pan with oil. Add mustard seeds and when it crackles, add cumin seeds and asafetida and cook for 10 seconds. Now add finely chopped onion, green chilies, garlic, curry leaves and sauté over medium flame till the onions translucent. Now add the cubed capsicum, salt and cook for 5-6 mins till the capsicum wilts and gets partly cooked. Add turmeric powder, red chili powder, coriander powder, mix well and cook for 5 more mins till the capsicum gets cooked completely. Now sprinkle 1 tbsp of roasted besan all over the curry and mix well. Then gradually sprinkle the rest of the gram flour while mixing the curry well. Cover the pan partly with a lid and cook the curry over medium flame for 5 more mins. Remove from fire, garnish with coriander leaves and serve hot with either rice or chapathis. That is a easy to make wonderful subzi. Have tried one. So i can tell it is really really tasty. 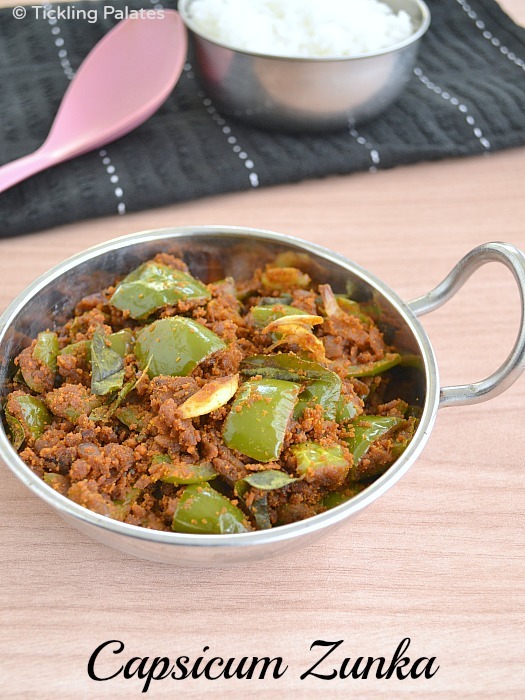 Toothsome capsicum stirfry……very well goes with warm phulkas. Lovely and delicious curry.. looks great!! Delicious and colorful looking capsicum subzi. Lovely clicks as well. Zunka looks very inviting. Happy to follow you. Do visit my space if you find time. Welcome back to blogging! I was wondering why there have been no updates from you! Glad to hear you are back with a zest! Very simple and creative. Thanks for sharing. You are surely one of the best people to write about cooking. I like when you say, crush the garlic with the skin, when you emphasize that patience will be an important ingredient in preparing the dish. These finer points of Indian cooking is overlooked by many writers. I have tried the dish before without garlic. Yet, I like what you wrote and how you wrote it. This is probably the only Indian capsicum dish I eat. But then, Indian cuisine is vast and my understanding of it is limited. One of the best zunkas I ever tasted…tried it today and got mesmarized… thanks! Hi Tharika, thank you so much for such a lovely feedback. Glad you liked it.